When you install Atman, you may pay Xcredit to place X power counters on Atman. Atman has +1 strength for each power counter on it. 1credit: Break ice subroutine on a piece of ice that has strength equal to Atman's strength. At 3+ install cost, Atman can be tailor made to target all instances of ice that share a particular level of strength. It is however inflexibly unable to target ice that is higher OR LOWER than this tailor setting. 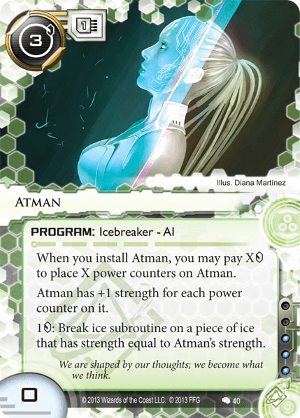 It's common for runners using Atman to install several copies of it forcing Corp players to diversify the strength of their ices when building their decks. Plugging holes: with a suite of Atmans installed at different strengths, Datasucker can potentially be used to fill in the cracks. Additionally for Anarch, Mimic, Yog.0 & D4v1d could add more efficiency to such a strategy. Atman can be installed in the early game to deal with a specific hole in the runners deck, then trashed to make room for other programs and then brought back (to deal with an end-game headache) from the heap with recurring cards like Retrieval Run, Clone Chip, Déjà Vu, Test Run, Scavenge or Trope but watch out for Blacklist or Chronos Project! Similar to Femme Fatale, the runner has lots of control in targeting ice, being able to custom create an instance ofAtman to deal efficiently with a specific level of ice is why Atman has been so popular in the past. Big taxing ice like Orion, Wotan etc can be much more efficiently managed with Atman targeting it at significant savings especially if the ice is guarding a server like R&D or HQ where the runner may wish to run repeatedly. Advance-able or otherwise adjustable strength ice such as Shadow, NEXT Bronze, Quicksand, Resistor, IQ, Fire Wall, Hadrian's Wall, Ice Wall can give a headache to any runner relying specifically on #atman as their AI of choice. Can be an interesting Shaper auxiliary ice breaker and possibly cheaper to install & certainly cheaper to use in many cases compared to others. It's inflexibility however makes Atman extra challenging to pilot. It's cons are pretty tough to overcome which is probably why this card hasn't been reviewed up until now. It totally blew my mind when I recently heard that Atman and Brahman are concepts in hinduistic philosophy that are related to each other and are in my view represented by both card's machanics. Brahman is the transcendet self, the universal energy; Atman is the individual self that wants to merge into Brahman to be finally liberated to step off the cycle of rebirth. Using Atman and Brahman both as breakers make total thematic sense: Atman sets its strength upon install (birth), but can be resetted when Brahman'ed (death, soul goes back into "pool"). Atman can then enter play again with a different strength (rebirth). Worth pointing out in 2017 that Atman combos with Sifr as a 3-cred near-universal breaker. A two-card skeleton key for the majority of defenses you'll face. And then you can just slap down another for Lotus Fields and similar.